Can all the hype about the advantages of hemp oil be true? It’s the only plant source that contains vitamin D, it’s the best-unsaturated oil, and it offers an abundance of essential fatty and amino acids that work wonders for your skin and hair? Well, quite honestly, the answer is yes. Hemp oil, also known (as hemp seed oil) is rich in antioxidants, Omega 3 and Omega 6 fatty acids. It actually contains some of the best essential fatty acids on the planet. While hemp oil won’t get you high, it can take your skin and hair to heights you’ve never experienced. 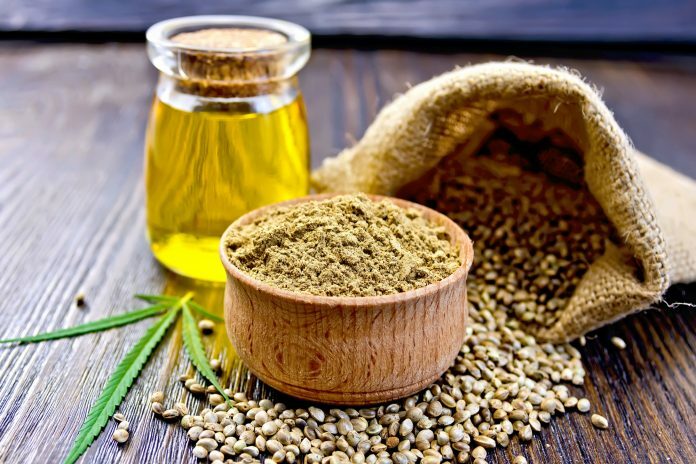 Here are six benefits of hemp oil for hair and skin. Here is how hemp oil makes your hair and skin healthier. Did you know that hemp oil can actually make your hair grow? That’s because it contains Omega-3, Omega-6, and Omega-9 fatty acids, the main fatty acids that stimulate hair growth. Hemp oil also helps fight hair loss because it stimulates the blood circulation on the scalp which enables hair follicles to get the protein and nourishment they need. Hair breaks when it becomes weak or overly dry and damaged. And it’s no secret hair breakage doesn’t look good on anyone. But luckily there’s a fix. Hemp oil can prevent hair from breaking. Hemp oil’s ingredients maintain your hair’s natural luster and silky texture when you use hemp shampoo and conditioner regularly. Hemp oil benefits both hair and skin. Hair can become dry and brittle easily. Culprits include the sun and wind, blow dryers, flat irons, and chemicals in the products we use on our hair and skin. One of the advantages of hemp oil is its ability to moisturize the hair and scalp. When you use hemp oil in your hair products, it actually helps repair the damage the other products cause. Just as hemp oil adds moisture to your hair and scalp, it also moisturizes your skin. And surprisingly, hemp seed oil works well for most skin types from the dryest to the oiliest. It won’t clog pores and it’s gentle enough for people who have sensitive skin. And its moisture lasts all day long. Apply it once in the morning. You won’t need to do multiple applications throughout the day like other skin products require. Check out some additional great tips for glowing skin. How many other products do double duty as both a cleanser and a moisturizer? Hemp oil does. It cleanses the skin, and it works for several skin types: dry, oily or combination skin. What makes it work so well is hemp oil’s ability to remove excess oil, moisturize skin and balance oils on the face. It’s much milder than soaps and cleansers. It doesn’t dry the skin and will remove those extra oily areas in the t-zone. Hemp oil can also be combined with your other favorite oils. Mix it with other oils like lavender oil or tea tree oil to up its cleansing and moisture effects. First, rinse your face with warm water. Spread hemp oil on your skin directly with your fingertips and massage it into your skin. After your skin absorbs it, rinse again with warm water to wash the excess oil away. Many healing creams contain hemp oil as their main ingredient. The reason: the cannabis in hemp oil works as a powerful anti-inflammatory. Cannabinoids in hemp oil soothe skin irritations by affecting the immune system in a positive way. The more cannabinoids the endocannabinoid system contains, the more they regulate an overactive immune system, the cause of skin irritations. Hemp oil also relieves skin conditions like acne and eczema. The cause of acne comes from a buildup of oil in the skin. The oil clogs pores and traps bacteria in the skin. The benefit of hemp oil: it fights acne in two ways. First, it unclogs the pores. Then it removes the bacteria that causes the acne from the skin. This happens because hemp oil is a natural antibacterial agent. When used regularly hemp oil can prevent acne from popping up on the skin. Hemp oil is gentler on the skin than other acne treatments. Most acne treatments and creams are made from chemical bases. These chemical bases can irritate the skin. So hemp not only clears up acne, it won’t irritate the skin with harsh additives and chemicals. Whether you have a chronic acne problem or have an occasional acne breakout, hemp oil can keep your acne blemishes under control. Like psoriasis, eczema is an annoying skin condition. People who have the condition often wear long sleeves to cover it up the condition, even when the weather is warm. Although they’ve tried a variety of eczema creams, many don’t work. Hemp oil has helped eczema sufferers with their skin condition when other products have faltered. This gives people with eczema a lot of hope as well as relief. So, what makes hemp oil a good treatment for eczema? The fact that it’s an anti-inflammatory, a moisturizer and is high in essential fatty acids makes hemp oil an effective treatment for eczema sufferers. It moisturizes the dry scaly skin that comes from eczema. But it also relieves the skin from inflammation that this disorder causes. So how do you take it? When using hemp oil for skin disorders such as eczema, the oil can be taken two ways. It can either be directly applied to the skin like a skin balm or cream or it can be taken orally. When taken orally, you can put it into a beverage or mix it with food. As you can see, the benefits of hemp oil for the skin and hair are abundant! Hemp oil adds moisture, reduces inflammation and fights bacteria to make skin and hair healthier. Want more great beauty tips? Explore our website for great content. Next articleBalayage vs Ombre: What Is the Difference?